This "old" recipe is one of my personal favorites. Cream butter and sugars. Blend in eff, peanut butter, sodad, salt and vanillla. Stir in flour and oats. Spread in 9x13 pan and bake at 350 for 20 min. Sprinkle with 1 cup chocolate chips. Let stand 5 min. 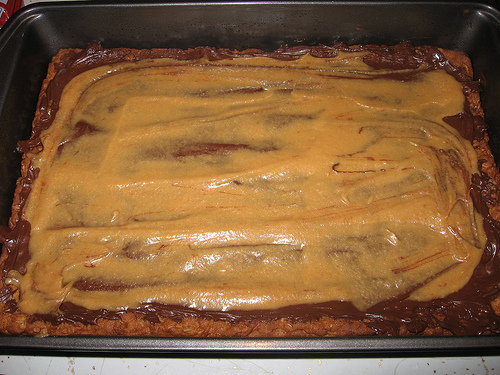 Combine 1/2 cup powder sugar, 1/4 cup peanut butter and 3 TBS milk. Mix well. Drizzle over bars. Cool.